While vegetarian/vegan eating is certainly becoming more popular, the majority of restaurants in America cater to an herbivorous diet. As a result, the few vegetarian/vegan dishes offered at a restaurant that doesn’t specialize in plant-based cuisine often miss the mark, in my opinion. When I’m at an establishment with a mostly-meaty menu and spy a veggie wrap or sandwich, I typically order it (or a salad), only to be disappointed by the texture and interpretation. You’ve seen this offering and may even have had it: grilled veggie wrap. This typically comes stuffed with overcooked, mushy portobello mushrooms, red peppers, and zucchini. The contents are often drenched in oil, mayo, cheese, or some other greasy substance that really takes away from the nutritional value of the veggies themselves. This wrap experience just doesn’t do it for me. As I’ve mentioned before, most plant foods are more nutritious in their raw state, so I really try to limit my cooking of produce. Obviously something like a sweet potato needs to be cooked, but raw zucchini, for instance, is actually delicious, if you’ve never tried it. 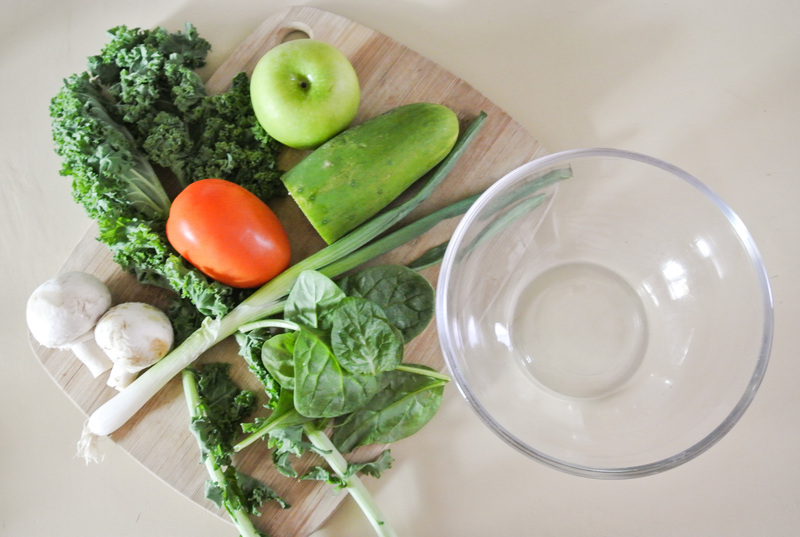 For me, texture is everything, and I prefer the crunch and freshness of raw vegetables over cooked any day. The method here is simple: For one twelve-inch tortilla, you need almost a full cereal bowl of fresh veggies/fruits to adequately fill the wrap. Of course, if you can adjust the amount to make a traditional sandwich instead. Enjoy! 1 12-inch tortilla –> I’m using spinach. 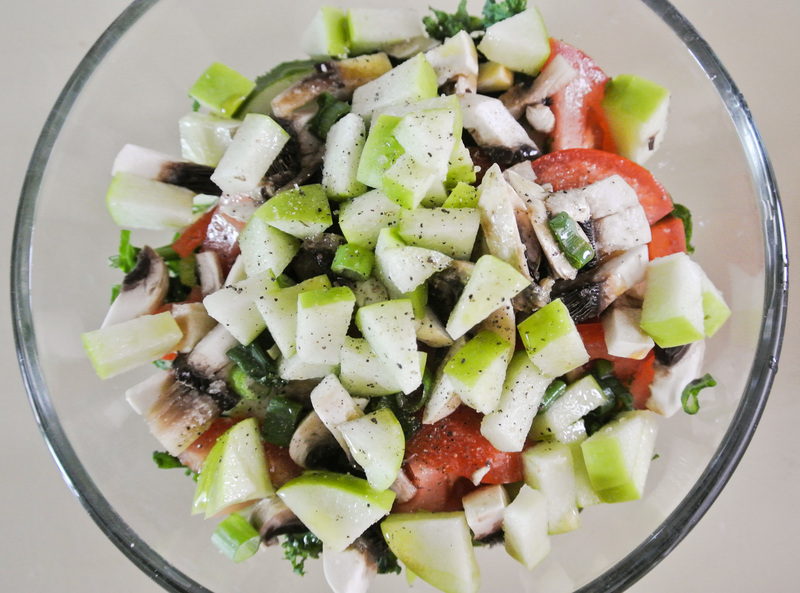 Enough raw chopped/diced/sliced fruit/veggies to fill ¾ of a cereal bowl –> I’m using a combination of kale, spinach, cucumber, roma tomato, green onion, button mushrooms, and green apple. 1-2 tablespoons homemade dressing of choice –> I’m using a lemon vinaigrette (or, consider my creamy dressing). 1 tablespoon “crunch” (e.g. raw nuts, seeds, etc.) or unsweetened dried fruit (optional, for additional texture) –> I’m not using any this time. Peel (if necessary) and chop, dice, or slice your fruit/veggies. Combine with dressing in cereal bowl. Assemble wrap and consume immediately. Looking forward to this when I am there!